When I went to see Cory in Grass Valley last month, she took me to her daughter Teresa's pottery studio, T-Pots Pottery, where I made this fused glass dish. I am so pleased with how it turned out! It was easy and fun to make. I wish Teresa's studio was in my neighborhood so I could make a few more of these dishes as gifts for family and friends. 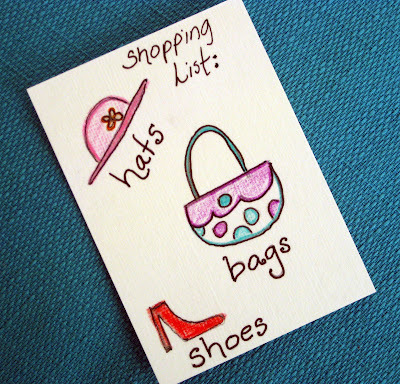 The theme for our August artist trading cards was bags and shoes (and optionally hats). I struggled and struggled and struggled with it and couldn't figure out what to do. I've found that when I become both blocked and obsessed about some creative pursuit, the best thing to do is make it as simple as possible. Hence my ATC with little drawings. I'm selling some of my furniture in preparation for the move next month and finding it surprisingly difficult to let go of my stuff. It used to be that I had no problem selling, tossing and giving things away, but I guess with age comes attachment. I sold my futon this morning and currently have an ad on Craig's List for this dining room table, which belonged to my grandmother. As I was writing the ad, a wave of grief washed over me because this is one of the last things that I have of hers. 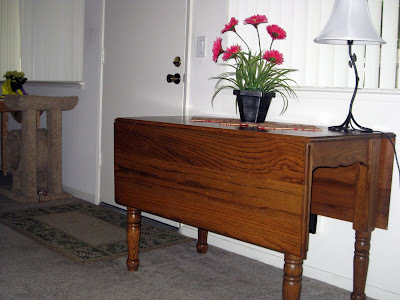 I've been using it as a desk the last year or so because I have a smaller table that fits better in the dining room, but there isn't room for both of them in my new place. I've tried to donate this potato chip can twice, but can't let it go. I got it from my sister a couple years ago, and she said it used to belong to our mother. When I saw it I was flooded with warm childhood memories, but to be honest I'm not sure if I actually remember this can or not. It is the contents that really got to me. Inside are the cookie cutters my mother used when I was a child. I have such fond memories of her baking for us. It is unlikely I will ever use these, but I don't think I can part with them. You might have noticed that I haven't been blogging or visiting your blogs as much as I used to the last few months. There are several reasons. One is that my workload at my job doubled and I don't have the time and energy that I used to have. Another reason is this time of year, the transition from summer to fall, is a funny time for me. It brings on a melancholy, and if I don't take good care of myself it turns in to full-blown depression by November. So I've been giving myself lots of quiet time to read and reflect. The last reason is I haven't been knitting much and don't have anything fiber-related to share with you. I'm thinking about starting a new blog that is more general or changing the name of this one so that knitting is no longer the focus. (Not that it ever really was.) I'm going to keep mulling it over and will let you know. Hope that you are enjoying your weekend. I do plan to visit your blogs later tonight or tomorrow. Wow, you have so much going on! I am no help with the getting rid of stuff:) I buy things from family members to keep NON-family members from getting family items! I am nuts! Hope all goes well with the move and if it causes you grief to get rid of something that you will regret... keep it and make room:) OR pass it on or store it and get it back! Love to you my friend! HUGS! You have LOTS going on and that can be overwhelming ~ so take your time about selling things. The table is awesome and of course the tin can with the cookies cutters is a must keep! I hope work will settle down and I would help you pack and move! Fun dish you made with Cory. Thanks for sharing. I love the glass! Oh, the potato chip can brings back memories. We would get Charlie's Chips delivered on Friday and then proceed to demolish them. Seeing a can always brings back memories...but to see all the cookie cutters, those are keepers. It does make one nostalgic, doesn't it? I hope that you have the time to take care of yourself. The pain of depression is too great. Ooh! I want one of those plates! I can see how you would have a hard time selling that dining room table. It's beautiful! I wish I lived closer - I'd buy it from you in a heartbeat! I get the not visiting/commenting on blogs thing. I've been feeling the same way, mostly because of Rex. I'm just not my witty self lately - plus I'm busy at work and with my course. I've done no sewing (except a bit on Sept. ATCs), so I don't have much to share either. I'm sure that will change for both of us. You could always just change the name of your blog to golden bird (and skip the "knits") then you'd be free to talk about whatever. But, you know, even if you keep it the same, we love to hear about more than just knitting. All things in life intertwine. Take care of yourself, my friend. And good luck with your move. I wish you joy and happiness in your new home! 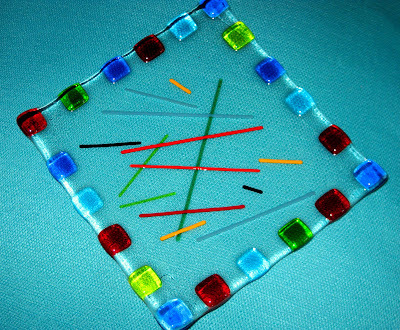 Wow - in that looong message, I can't believe I didn't even mention that I LOVE your fused glass dish. It is GORGEOUS! Hope you are enjoying your weekend. I am so proud of you for taking care of yourself and not pushing to do things when what you really need is time for yourself!!!! Love the glass dish that you made at my daughter's studio. I too wish she was closer but when I am in GV she is closer. Wow, that table is beautiful. I can understand the difficulty letting go of things. Our house is so small that editing possessions is an ongoing process. Its usually not a problem until I come across something of my Gram's that just doesn't have a place anymore. Thankfully, my sis has more room, so she becomes their curator for awhile. I feel your pain with the detachment. I have WAY too much stuff that I just can't bear to part with -- stuff that i'll probably never use. I do use my cookie cutters though -- and I have one exactly like that tin gingerbread boy that is in your can. Good luck with your separation of your stuff and stay cheerful -- you're going to a new, exciting place.